So there they were, literally dozens of dragonflies flying around two separate Vacaville (Calif.) yards, feasting on swirling clouds of prey (gnatlike insects) and then touching down on blades of grass or fence posts. They proved as elusive as a celebrities attempting to avoid a paparazzi. Bohart Museum of Entomology associate Greg Kareofelas of Davis identified them as variegated meadowhawks, Sympetrum corruptum. "Notice how the pterostigma is two-toned," he said. "That is the only dragon with that, also the two black spots at the end of the tail. They kind of migrate--or maybe mass dispersal is a better name. A bunch can show up if there is something to eat, then the whole gaggle moves on." The pterostigma cell, located in the outer wing of insects, is often thickened or colored and so it stands out from other cells, according to Wikipedia. 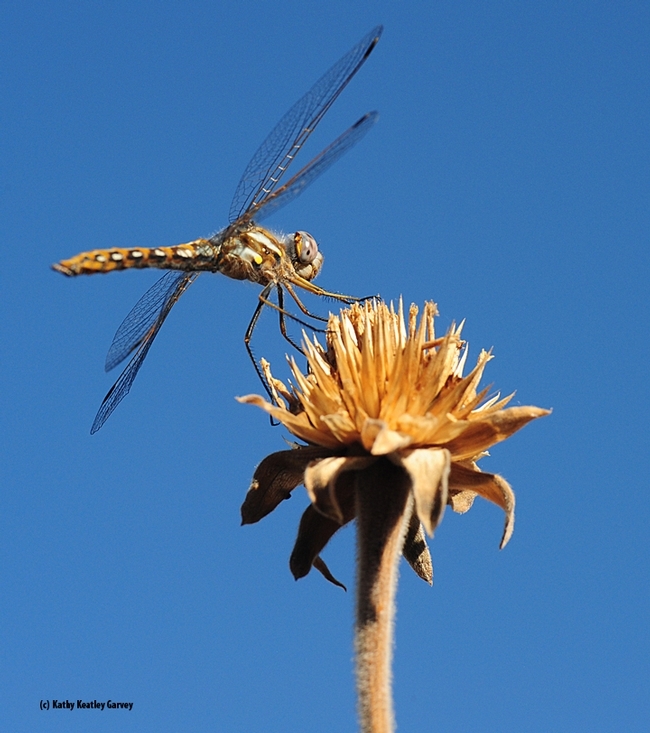 It is particularly noticeable in dragonflies, but is also present in other insect groups, such as snakeflies, hymenopterans and megalopterans. "The male is commonly dark brownish black with an abdomen of bright red, pink, and golden brown," Wikipedia relates. "The thorax may be marked with a pair of yellow dots on each side. The leading edges of the wings are marked with pinkish. The females are similar in color but not as brightly colored, with gray and yellow replacing the red of the male. Young variegated meadowhawks are much paler and mottled with pale green, pale yellow, golden brown, and orange." According to Odonata Central, "this species may be seen on the ground more than other meadowhawks. It will also readily perch on the tips of grass stems and tree branches. It can be numerous flying over roads, lawns, meadows, marshes and ponds...Mating occurs while perched on twigs, stems or other vegetation. Females lay eggs accompanied by males in the open water of ponds and lakes. Mass movements of this species have been reported on several occasions." 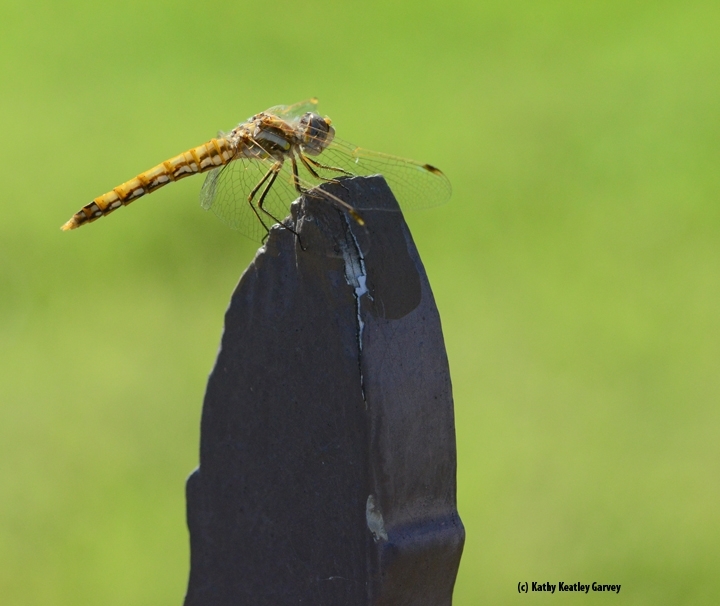 The variegated meadowhawk, native to North America, belongs to the family, Libellulidae. They're found throughout the United States and southern Canada, according to Odonato Central. "Also, Mexico south to Belize and Honduras." Coming soon to a yard near you?